The OMEGA PX750 Gage Pressure Transmitter brings true precision and reliability to industrial pressure monitoring applications. Process pressure is transmitted through an isolating diaphragm and an oil fill fluid to a central sensing diaphragm. The atmospheric or differential reference pressure is transmitted similarly to the other side of the sensing diaphragm. The displacement of the sensing diaphragm is proportional to the pressure differential across it. 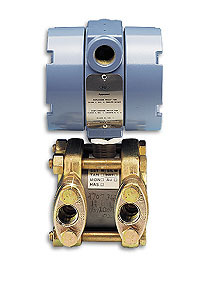 In addition to gage or differential pressure, the PX750 can also measure vacuums by simply reversing the process connection to the sensing element. Full overpressure protection to 2000 psi permits confident application in high pressure systems. Installation is simplified by a compact flexible design, 2-wire compatibility, internal span and zero adjustments all packaged in an FM approved, weather-tight NEMA 4 enclosure.